Warnings were ignored. The closure of the scheme was delayed while hundreds of groups in the know signed up. The eventual bill, sitting at the door of an administration committed to harsh austerity, dwarfs all the other scams and cons run by the local kleptocracy. Nor is there the slightest doubt that Arlene Foster’s fingerprints are all over it, first as Enterprise Minister and then as First Minister. In a normal democracy Arlene would be toast, especially with one of her ministers, Jonathan Bell, breaking ranks and claiming that his attempts to close the scheme were blocked and with the other party in the administration, Sinn Fein, gently muttering that she might consider temporarily standing aside. The DUP lost no time in trashing Bell or in telling Sinn Fein where to stuff their suggestion. Stormont is not a normal democracy. It is a sectarian alliance. Arlene’s role is not to oversee the proper use of funds but to supervise the share-out of the spoils of sectarian division. 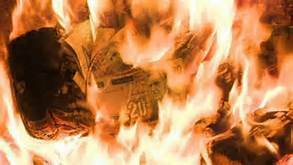 Other than its size, RHI is no different from many other Stormont scams – in terms of political corruption the use of public funds to subsidise an alliance between the DUP and UDA is a far stronger indication of the true nature of the administration. Why stop at calls for Arlene’s resignation? Is there a single one of the mini Trumps in the DUP who would behave differently? Why stop at the DUP? Is there anyone unaware of Sinn Fein’s role in guarding the DUP’s back? And it is Sinn Fein, not the DUP, who are at risk. The DUP stand secure in their defence of sectarian privilege and many of them would be happy to bring the forced marriage with Sinn Fein to an end. Adams and his supporters promised a gradual movement towards a democratic society, rather than the sectarian reality which is becoming more deeply entrenched. The anger of their supporters at their silence in the face of yet another dirty deal has forced them to step back from Arlene. If the DUP do not offer them a face saving device in the form of an enquiry the executive may fall. The experiment has failed. Stormont must go. Its time to call for its dissolution and to confront those in Sinn Fein and the trade union leadership who claim that the sectarian lash-up is gradually leading us to a better tomorrow and that the working class should foot the bill. The recent controversy over nearly £2 million in public funds being allocated to a “community” organisation with links to the UDA has once again highlighted the level of institutional support for loyalism. More broadly it reveals a system of pay offs and patronage that continues to underpin the political settlement in the north. In early October it was announced that the UDA linked Charter NI group had been awarded £1.7m by the Executive backed Social Investment Fund (SIF) to run an employability project in east Belfast. An accompanying press release contained quotes from First Minster Arlene Foster praising the work of Charter NI as well as a photograph of her alongside its chief executive – self-confessed UDA leader Dee Stitt. This chief executive position – which comes with an annual salary of £35,000 – is just one of a number of leadership posts within that organisation occupied by people with paramilitary links. Other senior employees of Charter NI include east Belfast UDA leader Jimmy Birch and his wife Caroline as well as former UDA prisoner and failed DUP election candidate Sam ‘Chalky’ White. Stitt and White also sit on a number of the SIF district steering panels – whose members are appointed by the Stormont Executive – which are responsible for allocating funding. 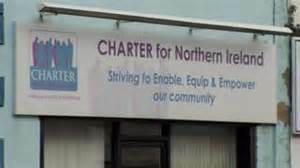 The east Belfast panel – whose members include White as well DUP political representatives Robin Newton and Sharon Skillen – was responsible for making the award to Charter NI. the Hanwood Trust (of which Jimmy Birch is a director) which was given more than £125,000 by SIF to renovate its headquarters. the Kilcooley Sports Forum (of which Dee Stitt is a senior member) which received £900,000 to build a football pitch. The Belfast South Community Resources (of which veteran loyalist Jackie McDoanld is a former employee) which got £700,000 to purchase an office block in Sandy Row. And the Resurgam Trust (of which UDA leader Adrian Bird is a paid director, and on which the ex-UDA prisoner Colin Halliday holds a senior position) which received £1.5 m.
Another example of a UDA linked project which has recently came to public attention is the Lower Shankill Community Association (LSCA) whose offices on the Shankill Rd were described in a BBC Spotlight programme as the “UDA headquarters” for west Belfast. Less than 24 hours after the broadcast the DUP communities minister Paul Given and four of his party colleagues visited the offices where they posed for a photograph with loyalist community workers including the UDA linked Denis Cunningham and Ian McLaughlin. As can been seen from the above list support for loyalist paramilitaries has been become routine. It barely generates a ripple of dissent. What caused the controversy around Charter NI was the comments made by Dee Stitt to a reporter from The Guardian newspaper in which he boasted about being the “big man” in his area and described the loyalist flute band he runs as “our homeland security” which would defend north Down “from anybody”. It is this gangster talk that brought the unwelcome attention upon Charter NI and the Social Investment Fund (SIF). However, it is not just talk. The continuing involvement of the UDA in the type of criminality – such as extortion, intimidation, loan sharking, drug dealing etc – that can covered by the label of gangsterism is well documented. The Bangor based UDA gang that Stitt leads has been involved in all of these activities. An example of the intimidation exerted in the town by his gang was revealed in a BBC Spotlight programme broadcast earlier this year. This focused on the case of community worker Aaron McMahon who was beaten with hammers after he objected to the erection of paramilitary flags and the siting of a bonfire close to a primary school in the Clandeboye estate. What was notable about this incident was the muted response of local unionist politicians and also the inaction of the police. The PSNI refused to name the organisation involved in the assault – putting it down to “small groups of individuals” – then advised the victim to approach Stitt in order to “negotiate”! More recently the UDA in north Down and east Belfast has been linked to the death of vulnerable 19-year-old Nathan Ritchie, originally from Bangor, who died in October after a fall from a bridge over Belfast’s Westlink. It has been claimed that the youth was forced onto the streets by the UDA over a £600 drugs debt and that it had ordered him out of his east Belfast flat having previously forced him out of Bangor. The involvement of the UDA in criminality has not been a barrier to funding flowing to projects linked to the organisation. For example, the funding for Charter NI was signed off on March 21 this year, less than two weeks after the Spotlight investigation named Stitt in relation to ongoing paramilitary activity in north Down. The controversy over Charter NI has served to highlight the role of the Stormont Executive – and in particular the Social Investment Fund (SIF) – in supporting paramilitary linked organisations. The SIF was established in 2011 as a ring fenced fund of £80m within the Office of First & Deputy First Minister (OFMDFM) which would allow the DUP and Sinn Fein to offer financial support to favoured projects. This was initially prompted by the actions of the SDLP’s Margaret Ritchie who, when Social Development minister in 2007, blocked funding to the UDA linked Conflict Transformation Initiative (CTI). To guard against such maverick actions – which struck at the pay offs and patronage that underpinned the political settlement – the SIF was created. The significance of this fund was that it was under the control of Sinn Fein and the DUP. To make it work as a slush fund also required some twisting of the rules related to spending and procurement. Firstly, funds could be not allocated on the basis of objective need as this would mean money going into predominantly nationalist areas. This was a condition insisted on by the DUP. Secondly, the selection of organisations to deliver projects and receive funding from the SIF could not be open. To this end various regional steering groups were created to allocate the funds. Crucially they were only allowed to allocate funds to organisations that were also represented on the various steering groups. As the members of the steering groups were appointed by the First and Deputy First Ministers (DUP & Sinn Fein) the allocation of funding to favoured organisations could be guaranteed. This is why UDA linked figures such as Stitt and Birch sat on both the steering groups and the boards of organisations that were in receipt of funds. Their only qualification for such roles was that they were members of the UDA – but this was the only qualification that was ever required. The SIF was slow to get off the ground and in the 2011- 15 period the distribution of funding was limited. There was also the unpredictable element of non DUP and Sinn Fein members of the Executive not going along with it. This happened again during this period when a Charter NI bid for funding for a project – similar to the one that has now been approved – was rejected by Alliance’s Stephen Farry in his role as Employment minister. In wake of this rejection the minister was lobbied on behalf of Charter NI by a DUP politician and a senior PSNI officer. Since the establishment of an exclusively DUP- Sinn Fein executive the operation of the SIF is ramping up significantly. The Charter NI episode has exposed the extensive links between the DUP and the UDA. This is particularly obvious in east Belfast where Charter NI employee and former DUP election candidate Sam ‘Chalky’ White sits alongside DUP politicians Robin Newton and Sharon Skillen on the SIF East Belfast Steering Panel. Through his positions on various public bodies Robin Newton has been instrumental in directing money to the UDA linked organisation For example, when he was a member of the Policing Board he put forward a proposal to transfer almost £90,000 from the Police Property Fund (into which unclaimed money derived from criminal investigations is placed) to Charter NI. The importance of Newton to Charter NI was revealed in a document that listed him as one of its “advisors” – this is despite the clear conflict of interest that arises from him sitting on a body that allocates funding and advising an organisation that is in receipt of funds. Robin Newton has refused to reveal whether he sat in on meetings of the board of Charter NI. As the speaker of the Stormont assembly he ruled out of order questions on Charter NI. No one seems to see this as a conflict of interest that would involve resignation in any elected office. The closeness of the DUP to the loyalists is also revealed in the party’s reaction to the escalating controversy. Questioned whether she regretted being photographed with Dee Stitt the DUP leader and First Minister Arlene Foster responded with a blunt no, saying that she would not “walk away from the loyalist community” but rather “try to bring them along, and try to get them away from whatever past they’ve been involved in”. When pressed further in the weeks that followed she dismissed the controversy as a “distraction” and then claimed that it would be “illegal” to her call for the resignation of a member of the board of a non-government organisation such as Charter NI. The DUP MLA Emma Pengelly, who was one of the architects of the SIF, described the position of Dee Stitt as an “internal matter” for Charter NI. Of course this is a deceit – no one in the Executive is barred from expressing an opinion. Moreover, it is the Executive that is directly responsible for appointing people (including Dee Stitt) to the various SIF steering groups. The biggest deceit of all from the DUP however is that the activities of the loyalists are in the past rather than in the present and ongoing. While Sinn Fein eventually reached the position of calling on Stitt to resign they have continued to defend the allocation of money to Charter NI and the general operation of the Social Investment Fund. Martin McGuinness praised the work of projects supported by the SIF and described as “nonsense” any suggestion that it is directed at paramilitaries. While the SIF is the biggest single source of funding support for the broad loyalist movement has been forthcoming from across the Executive and local government. The Belfast City Council backed Belfast Investment Fund (BIF), which is worth £27m and its sister fund, the Local Investment Fund (LIF), worth £4m are currently considering providing support for two projects – the Hanwood Trust and the Tullycarnet Action Group Initiative Trust (TAGIT) – linked to UDA leader Jimmy Birch. If funding is approved by councillors the projects will receive a combined total of at least £500,000 funding, with that amount potentially going up as high as £1m. Local councils are already major funders of loyalist bonfires with Belfast City Council alone providing almost £150,000 a year to organisers. The Minister for Communities – the DUP’s Paul Given – has recently announced the reinstatement of the Musical Instruments for Bands Programme. The fund, which was originally intended to cost £200,000, provides between £500 and £5,000 to marching bands who want to buy instruments. If all the applications – which overwhelmingly come from loyalist bands – are accepted the figure could rise to £300,000. Many of these bands operate as fronts for loyalist paramilitaries – a fact confirmed in Dee Stitt’s infamous interview with The Guardian in which he cited “running flute bands” as an example of the “community development” work being carried out by loyalist groups. The Loyalist Communities Council (LCC) represents an attempt to formalise support for loyalism. Backed by the UDA and UVF – and formed with the assistance of Jonathan Powell, Tony Blair’s former Chief of Staff – its launch in 2015 was accompanied by the familiar claim that loyalists had been “left behind” by the political process and needed help to make the “transition” to peace. While there was no funding mentioned it was implicit that help for loyalists would take the form of tens of millions of pounds. Despite the talk of moving on there is no indication that loyalist paramilitaries are any closer to disbanding their organisations and ceasing their activities. There is no serious demand for this from either the British government or the Stormont Executive. Indeed, their continued political and financial support for loyalism is serving to consolidate and legitimatise the presence of these organisations within Protestant communities. Why is this the case? Sinn Fein take the view that loyalists are their equivalents on one level – as former combatants in a conflict – and are content that they should be indulged so as long as their own people are being looked after. This equivalence allows Sinn Fein to justify and deflect away criticism of the patronage that is flowing to former Provisionals. As for the Unionists they have had a long association with loyalists – going back to the early 1960’s – and over the years have regularly made use of loyalist muscle and violence to press their demands. This relationship still exists and it can be seen operating in the recent disputes around flags and parades. Loyalists also play a policing role within the Protestant community – particularly within the working class – which deters people breaking from the cross class alliance that is the foundation of unionism. Behind all this sits the British state which has always viewed loyalists – and the virulent sectarianism they promote – as an essential tool in securing its strategic interests in Ireland. The political settlement has not changed any of these dynamics. On the contrary, as it is based on the management of sectarianism and the maintenance of partition, it can only reinforce them. The reason loyalist paramilitaries have not gone away is because what they represent and what they do are essential elements in maintaining that political settlement. How else do we explain the resources that have been poured into supporting a loyalist movement (which ranges from the Loyal Orders and flute bands to paramilitaries) that without such institutional support – and left to its own dwindling material resources – would be much weaker? The consequence is that sectarianism – rather than being allowed to wither away – is being artificially kept alive. The manoeuvres promoting loyalism and paramilitarism are built into the Fresh Start Agreement. One of the elements of that agreement was a policy document published recently with much flourish by the DUP/Sinn Fein administration purporting to be a strategy for eliminating paramilitarism. Clearly the DUP/UDA alliance utterly negates that strategy – indeed it negates all the claims of the peace settlement that there would be progress towards a democratic and non-sectarian society. Throughout the evolution of the settlement claims to restrain unionism have proved illusory but the evolution to the right is all too real. Austerity and the entrenchment of sectarianism continue apace, all the claims to progress by Sinn Fein come to nothing. The Assembly has proved to be nothing more than a way of sharing out sectarian privilege, with the lion’s share going to the DUP. The result is a constant hollowing out of Sinn Fein support, held in check only by the Catholic Church and Catholic middle class who are perfectly happy with their own gains.